Staying in good health doesn’t have to mean doing boring workouts each day. Senior citizens can benefit from a number of fun activities that will boost their physical and mental health while having fun. Whether seniors prefer fast music or slow songs, moving to the rhythm can improve their health. Elite Dance Studio reports that studies show that regular dancing may lower a person’s dementia risk, and it can also improve flexibility, bone density, muscle mass, and balance. Dancing can take place nearly anywhere. People can do it on their own at home, or they can enroll in a class at a local fitness center. Some gyms even offer water dance classes for seniors. Those with mobility issues can participate in dance activities from the comfort of a chair or move to the music while lying down. Seniors may enjoy shaping their own pottery pieces or painting a colorful picture. Even those who don’t feel naturally artistic may like coloring an intricate mandala design. American Orchards explains that art therapy has a multitude of proven benefits. Physically, it can improve hand-eye coordination. 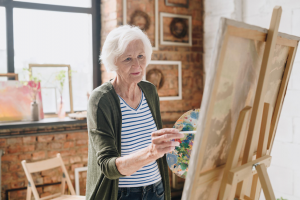 As seniors focus on their art, they may find that they don’t notice their chronic pain as much. Art can also help with mental health by elevating a person’s mood, reducing anxiety levels, and improving memory skills. Seniors who participate in group art therapy programs can build new relationships as well. Storytelling Arts of Indiana discusses how mental health is just as important as physical health for senior citizens, and telling a story provides good exercise for the brain. Some of the best stories for seniors to tell are tales about their own lives. This encourages them to sift through old memories and find creative ways to express their past experiences. Seniors who are able to write out their stories or type them on a computer may benefit from improved fine motor skills as well. Older adults can exchange written or oral stories with one another in a group setting. They can also tell them to younger generations, including family members or community youth groups, such as scouting troops. Physical and mental exercise for seniors shouldn’t be dull or boring. Through dance, art therapy, stories, and other engaging activities, older adults can stay in good shape while also having fun. These activities can even provide social outlets for seniors so that they can build friendships while exercising their bodies and their minds. Just because you live at home and you are living an active lifestyle doesn’t mean you don’t need help sometimes. Welcome Homecare is here to help! © 2019, Welcome Homecare. All Rights Reserved.